Mashobra is a lush green expanse in Himachal Pradesh, tucked away at a height of about 7700 feet, ensuring minimal human obstruction in the course of nature to provide you with the most pure and liberating experience of your lifetime. 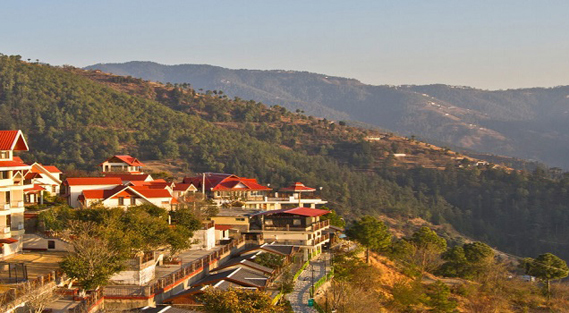 Mashobra's proximity to Shimla makes it a perfect alternative for people who are looking for a peaceful little hill-station. With just about enough resorts and enchanting natural bounty, come to Mashobra if you have a for a lazy weekend outing or a week long vacation. Craignano is an extremely spectacular tourist destination attracting maximum crowd of all visitors in Mashobra. It is located at a height of about 7700 feet. The one architectural marvel that attracts all tourists is the Italian Villa, flanked by streams and pines and oaks on all sides and constructed out of wood. Craignano is a spot for adventure sports enthusiasts as well, with options of rock climbing, rappelling and other activities available. It stands tall as one of its kind Italian constructional apex, named after the Craignano Town in Italy, by the Viceroy's baker and the Villa's maker, Chevalier Peliti. If you come to Mashobra, you just do not miss one of Asia's largest watersheds, supplying water to Shimla. The Reserve Forest Sanctuary is a must visit not only for being popular in the continent, but for the lush coniferous cover surrounding it, but also because it is a birdwatcher's delight. The weather is always pleasant, so you can pick up your camping bags and trek to the Sanctuary, camp out with friends or family and don't forget to carry your binoculars. You might just spot the famed pheasants, partridges and chikors here. Keep an eye out for the monkeys though. However, prior permission is required to visit this reserved area. Originally built as a residence of Lord Kitchener of Khartoum, this building is said to have been a favourite retreat of Lord Ripon. However, the building got burnt in 1993 and a new Wildflower building was built as a hotel there by joint venture between HP government and Oberoi group of Hotels. If you're a big fan of exploring little known traditions and festivals, you might consider visiting the Mahasu Peak in the month of May. The festival, known as Mahasu Jatara, falls on the third Tuesday of May, celebrates the shifting of the idol of the chief deity Lord Mahasu. Witness the native customs of the festival such as goat sacrificing, archery competitions, traditional dances and folk music. A strong cultural display makes for a must watch.